In 1900 there were 8000 registered automobiles in America and by 1947 that number had increased to over 30 million. Inspired by the “See America First” campaign and by visionaries with foresight and passion for conservation and the great outdoors, Americans started their engines and took to the open road. Bypassing hotels that had strategically served the railroads, wanderlust drove American’s to distant places where demand grew for clean, safe places to stay for the night. “Auto Camping” and free campgrounds emerged, allowing these adventurous travelers to stay off the beaten path. But “free” gave way as entrepreneurs catered to the demands of travelers wanting more than a place to pitch a tent. Developers of these early commercial campgrounds setup tents, bathhouses, and eventually cabins with kitchens and attached garages. Cafés and gas stations sprung up nearby, adding to the convenience of staying on the road. These “motor-courts” or “motor-hotels” morphed into the motel industry that “Howard Johnson” and “Ramada” made famous. 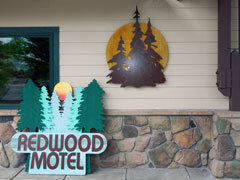 With humble beginnings over 70 years ago, the Redwood Court Motel pioneered lodging and Southern Oregon hospitality. The earliest known picture postcard of the motel is an artist’s rendition circa 1945 when the motel was known as the “New Redwood Court Motel,” with kitchenettes, modern conveniences and attached garages. The bold neon and small cafe of the “New Redwood Court Motel” were familiar icons for motels of the era. Subsequent picture post cards shown below, attest to the evolution of this landmark property that became the “Redwood Motel,” serving travelers continuously for 75 years. Evolving with the times, the Redwood Motel has been fully restored and recently expanded, creating the finest home-away-from-home experience in the Rogue Valley. To coincide with the upscale lodging and unique features of the Hyperion Suites addition to the property, the “Motel” moniker has alas been retired. So what’s in a name? Plenty when it comes to the “Redwood” that virtually defines hospitality in Grants Pass. No longer just a motel and not quite a B&B, nor a resort or inn. It’s a little of all of those and more. It may be affectionately known as “the Redwood” to returning guests and the community, but is now reinvented to a higher standard that is befitting of its namesake; the tallest tree in the world – the “Hyperion.” Nestled among stately Redwoods and award winning landscaping, the Redwood Hyperion Suites provide a unique and contemporary lodging experience in time honored tradition, honed by the vonCölln family for over 30 years. The management and staff invite you to stay under the redwoods and enjoy the Hyperion Standard of Excellence.